THREE BJP parliamentarians allege that their phones are being tapped by the care-taker Karnataka Government. Complaint has been lodged with State DIG and copies were sent to the Lok Sabha Speaker and the Union Home Ministry alleging violation of their basic fundamental right. 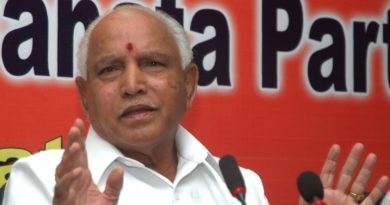 Also in Bengaluru after BJP’s Chief Ministerial candidate BS Yeddyurappa on Wednesday called on Governor Vajubhai Vala and requested him to allow to form Karnataka Government being leader of the largest legislature party , JD-S President HD Kumaraswamy, 58, alleged that BJP was trying to offer as much as 100 crore to secure support of a non-BJP MLA plus plum ministerial position.Yedurappa was accompanied by the BJP MLAs after he was elected CLP leader. Union HRD Minister Prakash Javadekar, BJP’s election in-charge was also with Yeddyurappa. Javadekar has rubbished the accusation. Kumaraswamy (in pic above),former CM for about a year and CM candidate proposed by JD-S and Congress, was on Wednesday elected CLP leaders of JD-S headed by his father HD Deve Gowda, 84. Incidentally, Gowda was PM for a coalition government for a year courtesy Sonia Gandhi but after one year from 1997 -98, Mrs Gandhi replaced him by Indra Kumar Gujral who was also shown the door after one year. However, Gowda maintains friendly ties with Sonia Gandhi. Meanwhile, there is allegation that both BJP and Congress were trying to lure their newly elected law makers .MLAS have reportedly gone missing since Wednesday morning – three from the Congress and two from the JD(S). There are other allegations of clandestine offers of ministership to shore up the magic number of 112 required to form government in Karnataka. Speaking to media after his unanimous election as CLP Leader, Kumaraswamy said “ We will meet the Governor once again with state Karnataka Pradesh Congress Committee President. There is no question of unconditional support. 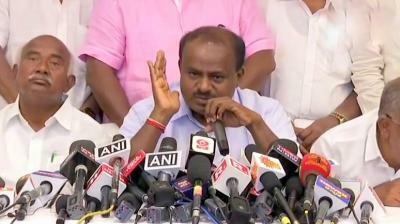 We will run the government smoothly with the Congress, says HD Kumaraswamy. Responding question on reported poaching, Kumaraswamy said, “Forget ‘Operation Kamal’ being successful, there are people who are ready to leave BJP and come with us. If you try to poach one from ours, we’ll do the same and take double from you. I’m also telling the Governor to not take any decision which encourages horse-trading.”“BJP’s Ashvamedha Yatra started in North; the horses have been stopped in Karnataka. This verdict is to stop the Ashvamedha Yatra,” Kumaraswamy said. “I have been offered from both sides (Congress and BJP). I am not saying this loosely. There’s a black spot on my father’s career because of my decision to go with the BJP in 2004 and 2005. So God has given me opportunity to remove this black spot. So I am going with Congress,” said Kumaraswamy MLAs are being offered Rs 100 crore each. Where is this black money coming from? They (BJP) are supposedly the servers of poor people and they are offering money today. Where are the income tax officials?”When it comes to proving the majority, party has to show numbers, we will do that for sure. I can’t speak openly but we will definitely prove the majority. 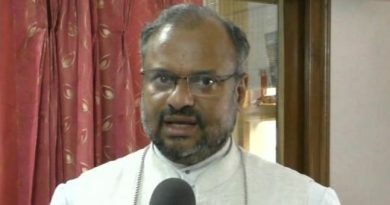 It is BJP who was given the mandate by people,” says Bhagwanth Khuba “HD Kumaraswamy will be the chief minister and there will be a coalition government. That is the only truth. People want him to be the CM. This kind of machination will happen but the fact is that HD Kumaraswamy will be CM. We won’t be influenced by anyone,” says JD(S) leader A Manjunath.“We are all together. All this is false news. In fact there are 6 BJP people, who are touch with us,” says Congress Leader MB Patil.“Governor is obliged to call the largest party, which is BJP. He should call BJP leader asking him if he can form the government. If he says he can’t, governor will then call the second party and if he says he can form the government the governor should give him time to prove the majority,” former Attorney General Mukul Rohatgi.“We are the single largest party. You have seen how the Congress and the JD(S) were fighting, six months back. Now, they want to come together and form the government,” said Union Minister DV Sadanand Gowda.“People want BJP government and we will make it. Anyone can create unnatural tensions, but the people of Karnataka are with us. After meeting, we will take necessary steps. The attempt made by Congress to make a backdoor entry is not appreciated,” Union Minister Prakash Javadekar.